Unique rock formations in the shape of a flowerpot make up the Hopewell Rocks along the Fundy Coastal Drive in New Brunswick. 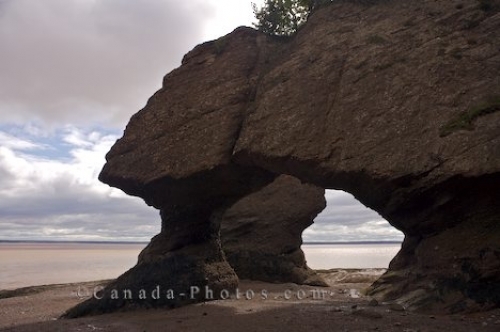 As the tide recedes, the beach at Hopewell Cape is open to tourists to explore the unique rock formations which make up the Hopewell Rocks in New Brunswick, Canada. The large rocks are called the flowerpot rocks which were formed by mud, pebbles and rocks and then slowly compressed into one solid rock. Over the years, rain, wind and storms ate away at these rocks, finally separating them into pieces and forming the flowerpot shapes. The daily tidal action still wears away at the base of the flowerpot rocks and at high tide kayaks can paddle in to view them. Picture of the flowerpot shapes of the rock formations at Hopewell Rocks in Albert, New Brunswick in Canada.